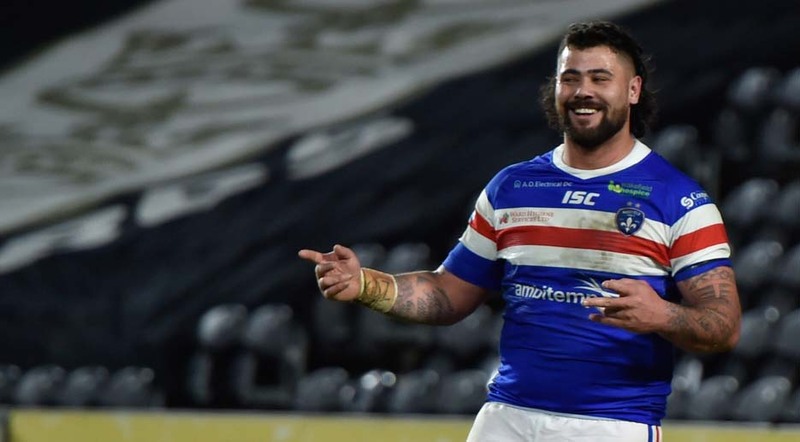 Wakefield Trinity suffered injuries to four key players tonight, but were able to hol on to defeat Wigan Warriors 30-20 at Belle Vue. Before the game Wakefield had named an unchanged 19-man squad from their previous one-point victory over Huddersfield Giants. Jordan Crowther dropped out of the 17-man squad with Anthony England coming into the squad to start the game. Wigan had lost Dom Manfredi, Jarrod Sammut and Joe Greenwood to injury, and Zak Hardaker was a late withdrawal for personal reasons. It meant that there were recalls for Morgan Escaré, Tom Davies, Sam Powell and Liam Paisley. Wigan were the first to score through winger Joe Burgess, and Wakefield suffered injury blows to Anthony England and Reece Lyne, while later on they would also have injuries to Jacob Miller and Kyle Wood. But in a remarkable final five minutes of the first half Trinity scored three tries through Craig Kopczak, Joe Arundel and Max Jowitt, with Danny Brough adding two goals for a 16-4 half-time lead. In the second half Wakefield added two tries from Ben Jones-Bishop, both converted by Brough, while Wigan scored tries from George Williams and two more from Burgess for his hat-trick, with Morgan Escaré adding two goals. Wakefield: Ryan Hampshire, Ben Jones-Bishop, Reece Lyne, Joe Arundel, Max Jowitt, Jacob Miller, Danny Brough, David Fifita, Kyle Wood, Anthony England, Pauli Pauli, Matty Ashurst, Tinirau Arona; Subs: Keegan Hirst, Justin Horo, George King, Craig Kopczak. Wigan: Morgan Escaré., Tom Davies, Dan Sarginson, Oliver Gildart, Joe Burgess, George Williams, Jake Shorrocks, Joe Bullock, Thomas Leuluai, Romain Navarrete, Willie Isa, Liam Paisley, Morgan Smithies; Subs: Sam Powell, Oliver Partington, Joe Shorrocks, Taulima Tautai. A full report and photos from this game will feature in Monday’s edition of League Express.